Our beginners’ course which will teach you everything you need to know to be a safe, competent archer. These courses are mandatory for anyone wishing to join an archery club. The courses are run 3 times a year and take place over a 4-week period. Beginners must attend at least 3 of the 4 sessions to complete the course but attendance at all 4 sessions is strongly encouraged. All beginners completing the course will be awarded a certificate. The beginners’ courses are run by a qualified Archery GB coach assisted by some of our most experienced club members. The cost of the course is £50 for adults (age 18+) and £30 for juniors (aged 10 – 17 years). This fee covers insurance, the cost of tuition and the provision of all necessary equipment. Having completed the course, beginners may apply to join the club. For further details or to put your name down for the course please contact the club secretary. Please note: the minimum age for the beginners’ course is 10 years, children must be accompanied by a parent or guardian at all times. Then you’re missing out! We recommend that you come along to one of our regular have-a-go sessions on the first Friday of the month (May to September only), this will give you a chance to experience archery before committing to the cost of the full beginners’ course. The sessions run from 6pm to 8pm and are approximately 30-45 minutes long (depending on numbers). All equipment is provided as well as tuition from a qualified Archery GB coach or an experienced club archer. These sessions are by arrangement only so please contact the club secretary to book your session. 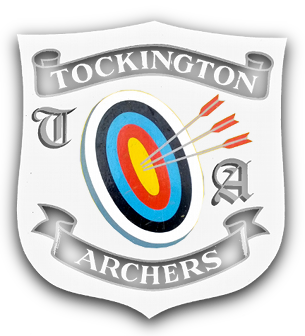 Alternatively, come along to the Archery GB Big Weekend which is supported by Tockington Archers every year. This is a free event normally held on a Sunday around the end of May where you can try archery, meet the club members and see some demonstrations of different bows and shooting styles. All equipment is provided as well as tuition from a qualified Archery GB coach or an experienced club archer. Please note: the minimum age for any have-a-go session is 10 years, children must be accompanied by a parent or guardian at all times. New members wishing to buy their first set of equipment should, wherever possible, seek advice from a senior club member. We strongly advise new members not to buy equipment from secondhand shops or general sports equipment dealers. If you are given secondhand equipment by a friend or relative, please ask a senior club member to check it over before you use it.